Fire Safety for Your Home The National Fire Protection Association recommends storing one ladder in every occupied room of your home that is above the main level. With a Kidde Escape ladder, you can keep your family and children safe in the event of a fire or other emergency. Ideal for Second- or Third-Story Escapes The National Fire Protection Association recommends storing one ladder in every occupied room of your home that is above the main level. With a Kidde Escape ladder, you can keep your family and children safe in the event of a fire or other emergency. Ideal for Second- or Third-Story Escapes The Kidde Escape Ladder is available in two models. Each model features a strong and lightweight design, compact storability, and one-foot wide rungs. The Kidde KL-2S extends to 13 feet for use in second-story rooms, and the Kidde KL-3S extends to 25 feet for an escape route from third-story rooms. Quick and Easy to Use Kidde Escape Ladders store compactly and don't deploy until you need them. Each ladder fits easily under a bed or in a closet near the window. If a fire necessitates an escape from the second or third story of your home, it's easy to move a Kidde Escape Ladder to the window, open and place the attachment hooks over the windowsill, and pull the release strap to unfurl the ladder. Warning: Kidde Escape Ladders are designed for one-time use only. Discard after single use. Repeat use may result in injury or death. 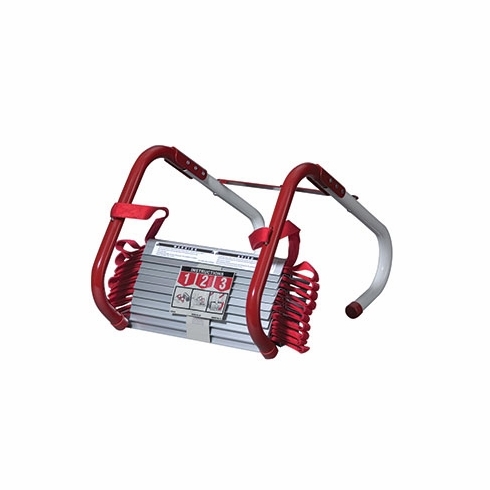 Strong and Durable With metal rungs and red nylon strap rails, Kidde Escape Ladders can support up to 750 pounds on one rung or 1,000 pounds when the load is distributed on more than one rung. Anti-slip, zinc-plated steel rungs prevent slipping and ensure a safe descent, and the ladders are flame resistant for increased protection. Kidde Escape Ladders are backed by a five-year manufacturer's limited warranty.